If you didn’t know any better, wouldn’t you think geography careers were only about looking at maps and land formations? Well, that is so not the case. Geography majors study everything on the Earth, from the land and water masses, to their distinguishing features, to the very creatures who inhabit it. Yes, they may even be able to name all the countries, states, and capitals, as well. If everything about this planet interests you, then a career in geography may be calling your name. The geography field is broad and offers a wide variety of careers to choose from. From studying the Earth’s composition, to recommending zoning restrictions, to predicting the impact of the next natural disaster; the possibilities for a career in geography are endless. There are two disciplines that geography is divided into. Human geography, which is the study of people, places, and cultures. And physical geography, which focuses on the natural environment. As a major, students are taught a variety of useful skills that open a number of career paths. You will help examine political and cultural structures as they relate to geography. Using your amazingly honed research skills, you will help governments and businesses plan where to build homes and roads, respond to disasters, and develop marketing strategies. The computer, research, and analytic skills you’ll be taught as a geography major will be valued by many potential employers. Geography is considered a science, and it’s closely related to earth science, sociology, and anthropology. Depending on whether you choose to study human or physical geography will determine which college courses you’ll take. In some instances, you can learn about both before you make that hard decision. You’ll also be able to graduate with a bachelor of arts or science in geography. Go after a bachelor’s degree. Participate in the field trips, join your college geography club, and learn all about the various relevant computer programs. Get an internship, and really learn the geographic information systems (GIS) because you’ll need to really know it for future employment. To get a job outside of the federal government, you’ll need a graduate degree. So, if a government job isn’t where you want to be, head back to school for a master’s degree. This should take one to two years. Really focus on your research skills during this time. It’s going to be something you’ll do a lot of during your career. Get a job to gain experience. It’s always a wise idea to join a professional organization. Certifications are voluntary yet highly recommended and preferred. Because most positions will require you to be extremely proficient in GIS, you can get a certification through the GIS Certification Institute. Geography is a broad field. Every aspect of it tries to find answers to explain the world we live in plus everything in it. You’ll explore the impact factors have on both the physical and human elements. Within the field, there are a few specialties you can decide to focus on while in college. These specializations will prepare you for a varied set of careers after school. Cultural Geography: You’ll be an expert in cultures, customs, traditions, and other important areas of study. You could choose to focus on one particular region, or look through a wider lens and go international. Environmental Geography: Through this specialty, you study climate change, habitat loss, natural disasters, or anything that impacts our environment. Glaciers and Glaciations: There are close to 200,000 glaciers worldwide. You will study how they impact our world and climate change, how they were formed, and their effect on land. Historical Geography: This specialty studies geography and the past, comparing and contrasting the similarities and differences between then and now. You’ll investigate the patterns and processes to see how we have gotten to where we are, and make educated predictions as to what the future holds. Hydrology: Water is your primary focus—its uses to flood forecasting and everything in between. You could specialize even further, working in areas such as the agricultural use of water, or hydropower. Political Geography: This specialty will have you studying politics, people, and land. One example would be countries in conflict; another is how governments react to disasters. A related field would be electoral geography. This examines the election process in relation to states, town, cities, or other geographic boundaries. Population Geography: This particular specialization uses analytics and statistics to study the human population with an emphasis on trends and density. Birth and death rates are also studied, along with increases and decreases in population in any given area. Urban Geography/Urban Studies: This field is a mashup of geography and urban studies. You look at the design of a city, see what’s working, and how it can be made better in the way of transportation, healthcare, education, crime, and other factors that make an impact in a town or city. 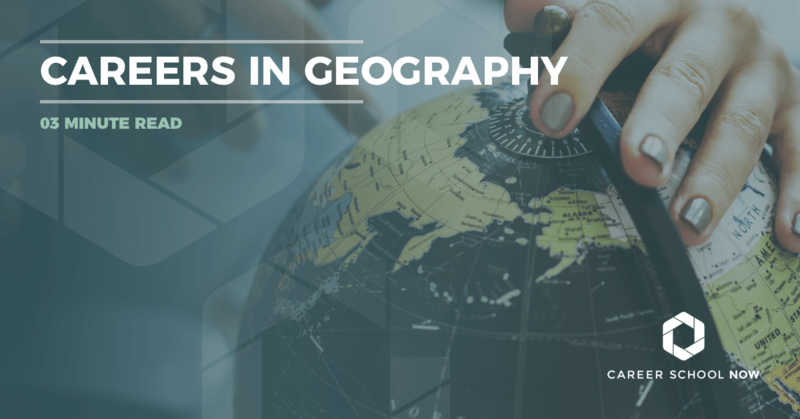 Once you go through a geography program and have your bachelor’s and master’s degree, you’ll be qualified to work as a geographer. You will study the planet and pretty much every aspect involving it, from the way land is distributed, to the population, to the political and cultural structures. The median annual wage for this profession is $76K, and the job outlook is expected to be in line with most other occupations. With your degree in geography and your proficient knowledge of the Geographic Information System and web-based mapping technologies, you can become a cartographer. Depending on which state you are employed in, you may need to be a licensed surveyor, as well. You’ll collect data, create a visual representation of the data, such as a map, and prepare it for mass usage. Your career’s annual median salary is more than $63K, and employment growth is expected to be 19 percent through 2026. Chances are, you’ll find a job with the local government where you’ll help come up with best use ideas for available land. You might recommend locations, zoning regulations, and other planning details that minimize the environmental impact. The field is expected to grow 13 percent, which is faster than the average for occupations. The median annual pay for urban planners is $71K, with the top 10 percent earning more than $108K. You will study the physical aspects of the Earth and other planets to learn more about their past, present, and future. You analyze aspects such as the composition, structure, and processes. You’ll make a median annual salary of $89K, and there will be about 4,500 new jobs opening through 2026. That’s a lot of jobs considering there isn’t a huge number of students who go into geography. You could also use your geography degree to go into teaching or academia, where you can share your passion of the subject with a captured audience of malleable minds. For many students, online classes make much more sense than the traditional classroom route. Online school may not always be the less expensive alternative, but for students that work full time or have other obligations, the flexible schedule makes going to school reachable. Plus, you save money by living at home as opposed to being in a dorm. Most of the online programs can be completed entirely online, but you may have to find your own internship. There are quite a few online geography degree programs where you can earn your bachelor’s degree. There are some master’s programs as well, with the Master of Geographic Information Systems or Science programs being the easiest to locate. Just make sure that whatever program you choose, whether it’s online or physical, that it’s accredited.